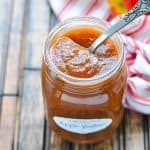 It wouldn't be fall without a few batches of this easy Slow Cooker Apple Butter! Thanks to the Crock Pot, the sweet spread fills your house with the cozy aroma of simmering apples, cinnamon, and cloves -- with very little effort on your part! Spray the inside of a 6-quart slow cooker with cooking spray and place the apples inside. I use as many apples as it takes to fill up my slow cooker! Uncover, give it a good stir, and continue cooking uncovered for an additional 2 hours on LOW or 1 hour on HIGH. This will allow the apple butter to cook down and thicken. Use a hand blender to puree until smooth. If you don’t have a hand blender, transfer to a regular blender and puree in batches. Store in mason jars in the refrigerator for a few weeks, or keep in the freezer. If you want to store the apple butter in a pantry, be sure to follow proper canning procedures (sterilizing and processing jars). Truly, the options are endless!